The last few yards of skein 3 and all of skein 4 have been used. The Wavy Ribbons scarf is now about 60 inches long (59 to be precise)--one more skein and it will be over 6 feet (73/74 inches or so)--which will be a fine length I think. I went out yesterday twice—once for quick errand, and later for a brisk walk, and both times forgot to get my secret sock project –that I knew I had left in the car. Went out a third time just before dinner, JUST to retrieve the socks, and got a scant inch of them knit after dinner. So, today's goal is sewing—but there will be time for knitting, too. I think I am going to work mostly on the scarf, and get it finished. The socks are well—socks. I wanted to have a pair of socks with cables for my secret sock project. Lots of people love cabled socks. I am not one of them! 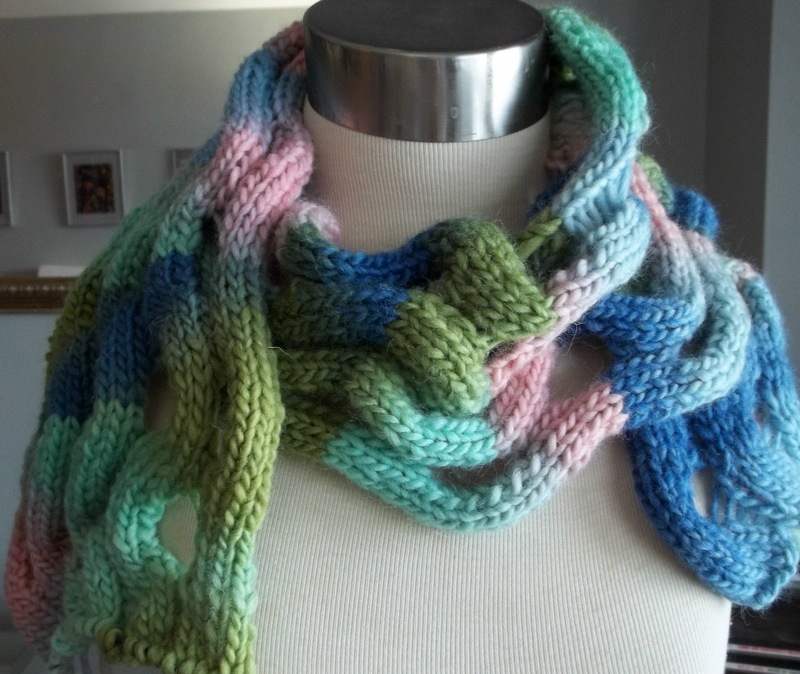 The cables look good, and it is a simple, easy to do one-- No cable needle required. But cable just don't do anything for me. Maybe it's my early childhood of ugly and uncomfortable cabled knee high socks that were part of my school uniform, maybe it's just that cables are OK, but just not too special to my way of thinking. I've made things with cables over the years, even some big projects, but I am some what indifferent to cables. They are still putzing around on the scaffolding, and still haven't started to disassemble it. Every little noise bothers me—I look to see if what I am hearing is the structure coming apart, and so far it seems nothing has changed. Enough already!--OH, wait, they have just removed the 2 X 4 that blocked my terrace door! The scaffolding might not come down today... but!! !